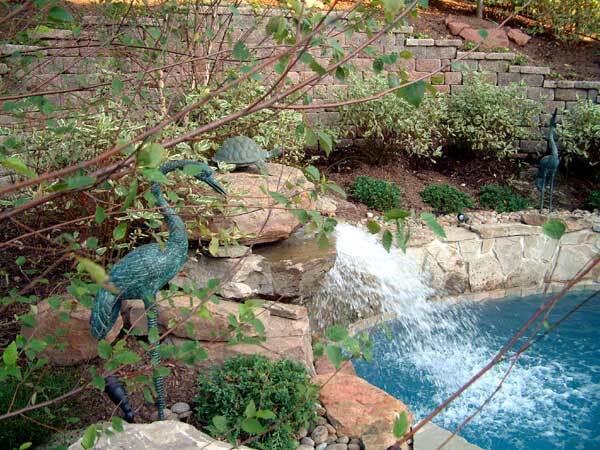 A naturalistic pool was designed to create a lagoon type setting for this property. The curve of the pool and stone paving, similar to bluestone, was used. Soft plants with lots of color throughout the season added to the look. There are many other pool paving options that could be used, such as pavers or travertine pavers for this other lovely swimming pool design. Even colored concrete can be used. It can be scored into a geometric pattern for an interesting design and this can keep costs down if desired. 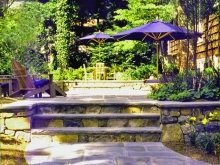 Travertine pavers are an excellent choice for pool decking. 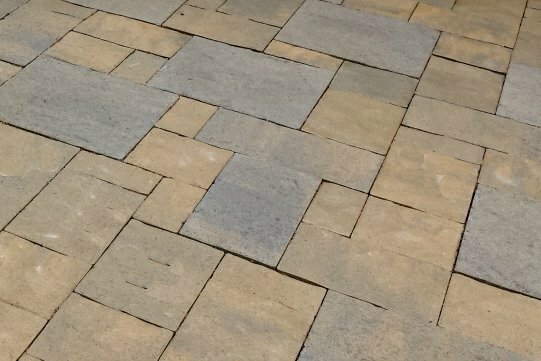 They are similar in cost to bluestone (dry laid) but cool on your feet. The beautiful waterfall is lovely to watch while outside, and it may also be viewed from numerous places inside the home. The soothing sound of the waterfall adds to the ambiance. 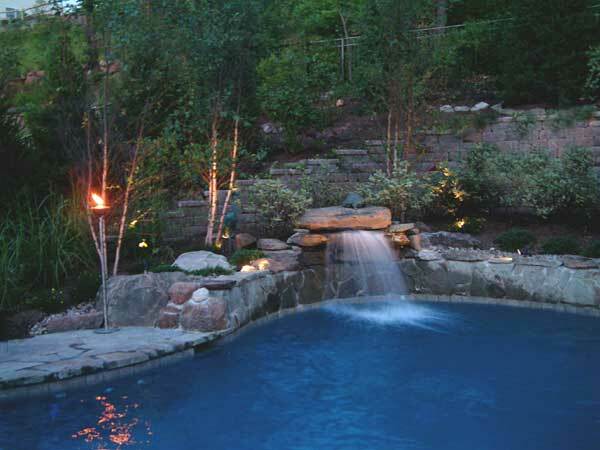 Creative night lighting lets you comfortably use the pool in the evenings. Note how the trees are lit up along with the waterfall. The rear slope needed to be cut back to allow ample room for the swimming pool and paving. 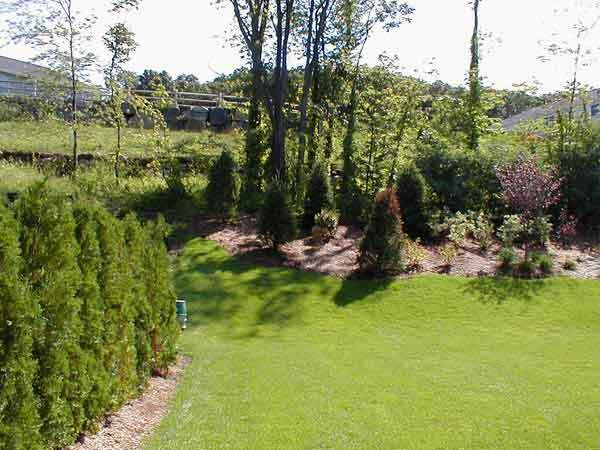 Not only was a retaining wall designed, but also a pool wall to help with the grading. It also created a beautiful look. 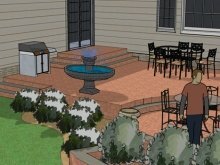 Various material choices are suggested with the pros and cons discussed in detail. Once these vital decisions have been made, the design is created. Top contractors can be recommended and an honest evaluation of their bids can also be provided if desired. 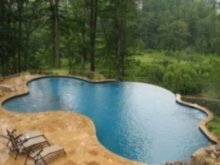 Finally, we can work with the pool contractor, making sure that our plan is followed with regard to correct elevations, shape, location, and other crucial details. This is my project management option. I work solely in the interest of my clients, provided peace of mind and a smooth project. Please share this page if you enjoyed it. 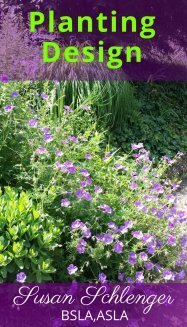 You will also receive my newsletters with exciting landscape tips.